Welcome to American Site Restoration, Inc.
American Site Restoration Inc. is a full service consulting and restoration firm with 32 years of combined experience in the environmental field. American Site Restoration, Inc. in the News!! American Site Restoration, Inc. was consulted by ABC Channel 7 News in New York City regarding the recent steam explosion outside of Grand Central Station. Please follow this link to view the full video and find out what Steven Gordon, Owner of ASRI, had to say about clean up and repair of the building. Phase 1 Site Assessments, Phase II Assessments, Brownfield Sites, Hazardous Waste Management Programs, RCRA Compliance, OSHA Compliance, Expert Testimony, OPA 90 Compliance, SPCC Plans, Remedial Over-site, Wetland Delineation Studies, Environmental Permit Administration. DOT / EPA / OSHA in-House Training Programs, Mold and Microbial Response and Remediation (levels 1 to 5), Blood Borne Pathogens, OSHA 1910-120 Training (First Responder 1 and 2) Hazardous Materials Technician, Hazardous Materials Specials, On-Scene Incident Level 5, 24Hr On-Site Emergency Response, 40 HR Hazardous Wast Site Operation, OSHA 1910-120"Unique Function Series, Incident Commander, OPA 90 "Facility Qualified Individual", Marine Oil Spill Response, US DOT/Homeland Security Hazardous Material Transportation and Security. Soil Remediation, Hazardous and Non-hazardous On-Site Bio-Remediation, Oxidation and Containment Stabilization, Off Site Hazardous and Non-hazardous Transportation and Recycling via Low Temperature Thermal Desorption, Hot Mix Asphalt and Cold Mix Encapsulation, Hazardous and Non-Hazardous Waste Disposal, Chemical Lab Packs, Mold Remediation, Fire Damage Restoration, Water Damage Restoration/ Underground / Above-Ground Storage Tank Removal, Wetland Reconstruction and Erosion Control. Cold patch that can be used on the town's roadways may be a viable solution. That's what Steven Gordon of American Site Restoration told the Riverhead Town Board last week. We are a company centered around protecting the environment and helping to expand the knowledgebase of companies seeking to keep their employees safe. Mr. Gordon has thirty four years experience in the hazardous materials remediation and in regulatory compliance as a project manager, waste operations manager and project management. Also Mr. Gordon has extensive experience as a Hazardous Materials, Safety and Regulatory Compliance Instructor. While a staff member of the US Coast Guard Marine Safety School Mr. Gordon conducted Hazardous Materials and RCRA/CERCLA response courses, as well as RCRA compliance and DOT Safety Courses in civilian practice. Mr. Gordon was also a member of the Atlantic Area Strike Team and participated in numerous oil spill and chemical incident emergency responses. 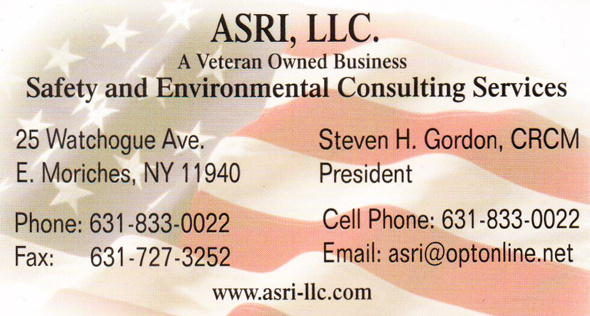 After retiring from the US Coast Guard Mr. Gordon has managed all regulatory affairs and waste disposal practices for various environmental companies and several major oil companies. Mr. Gordon also managed numerous WMD emergency responses.